All 2019 Command Senior Enlisted Leader assignments for all branches of the United States Armed Forces. The CSEL is the direct representative to their principal on management of all efficient and effective day to day activities in their area of responsibility (AOR). U.S. Navy Command Master Chief Ryan Burton, currently assigned as the command master chief for Explosive Ordnance Disposal Mobile Unit Three, San Diego, California, has been selected to replace Command Chief Master Sgt. Richard L. Winegardner Jr. as the senior enlisted advisor for U.S. Africa Command, J3 Operations and Cyber Directorate, Stuttgart, Germany. U.S. Navy Command Master Chief Philip Ibanez, currently assigned as the command master chief for Explosive Ordnance Disposal Mobile Unit Twelve, Virginia Beach, Virginia, has been selected to replace Chief Master Sgt. Timothy Horn as the command senior enlisted leader for Defense Threat Reduction Agency, Fort Belvoir, Virginia. U.S. Air Force Chief Master Sgt. 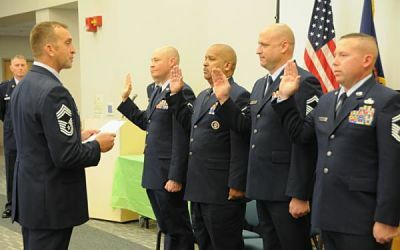 Gregory A. Smith, currently assigned as the command chief master sergeant of Air Force Special Operations Command, Hurlburt Field, Florida, has been selected to replace Command Sgt. Maj. Patrick L. McCauley as the command senior enlisted leader for U.S. Special Operations Command, MacDill Air Force Base, Florida. U.S. Marine Corps Sgt. Maj. Steven M. Burkett, currently assigned with Marine Corps Embassy Security Group, at Quantico, Virginia, has been selected to replace Chief Master Sgt. Zako Mazid as the command senior enlisted leader for Joint Task Force Guantanamo Bay, Guantanamo, Cuba.